Thank you to Julie for emailing me this fantastic find! Autumn Cashmere's ribbed draped cardigan retails for $264 at Neiman Marcus. 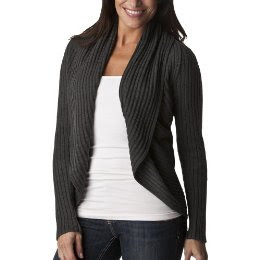 You can still be fashionable with a chunky ribbed cardigan for fall, but with a much lower price. Check out this version Julie spotted from Mossimo Black, currently on sale for $24.99 (down from $27.99). If you're interested in purchasing, you can click here.